Is AOM AV1 a disruptive technology? The story of AOM (Alliance for Open Media) officially begins in August 2015 with the first collaboration steps in early spring 2015 after one more licensing pool for HEVC – HEVC Advance - appeared in addition to MPEG LA’s HEVC Patent Portfolio License. It was not the direct consequence, but no doubt, the catalyst of what is foreseen to be significant technology advancement and the growing popularity of AOM AV1. Initially, licensing conditions for HEVC/H.265 from MPEG LA were quite frugal - first 100,000 devices/copies per year for free, then $0.20 per copy for a maximum of $25 millions per year. There was no charge for content production and distribution in the HEVC format. HEVC Advance added from $0.20 (mobile phones, main profile, region 2) to $1.95 (UHD TV, main profile + all three extensions, region 1) per device. For content, the cost is 2.5¢ per subscription per month for OTT operators and 1.25-2.5 ¢ per title for content distributors. For small licensees (less than 100 thousand devices per year) HEVC is no longer free. For bigger players, the cost to use the HEVC patents has increased significantly causing a slowdown in HEVC adoption. The decision of Technicolor to license its HEVC IP portfolio directly to device manufacturers rather than through the HEVC Advance patent pool has changed the cost structure to being even more complex. The new technology is called AV1 (AOM Video 1). Google’s VP10 was taken as the basis, Cisco’s Thor and Mozilla’s Daala contributed deblocking and deringing filters, Perceptual Vector Quantization. The official announcement of the alliance was released on August 28, 2015. The goal of the project was "an open royalty-free video codec specification based on the contributions of members, along with binding specifications for media format, content encryption and adaptive streaming". Initially, the statement did not cause much excitement. However, as early as in March 2016 it became clear that the quality of AV1 encoding was getting close to HEVC, the June’s update showed significant progress, and in 2017 the January’s update already exceeded HEVC HM 16.11 on almost all derf’s collection of test sequences (Fig 1-1). The quality of encoding of intra frames is striking, almost all intra blocks in AV1 are encoded more efficiently than in HEVC, with a similar partitioning. Asymmetric Numeral Systems coding by Jarek Duda brought entropy coding mechanism which is many times faster and simpler than CABAC. Tools such as Elecard's StreamEye with AV1 support will be key to validating quality of encoding (Fig 1-2). With the significant improvements of encoding quality, the Alliance quickly began to grow in participants. As of April 10, 2017, there are 23 members which include industry ecosystem giants such as Adobe, AMD, ARM, Broadcom, Nvidia, Xilinx among new members. Only two of the Alliance members - BBC and Vidyo are licensors of MPEG LA. We are seeing not just the struggle between two technologies of video compression, but the clash of two fundamentally different ways of doing business. Relatively young companies working mainly in OTT, on the one side, and traditional broadcasters on the other. It is unlikely that TV Broadcasters will switch to a new encoding format, even the free one, if it does not exceed its predecessor by at least 50% fewer bits for the same visual video quality. For OTT proper, royalty free AV1 will be most likely favored to the royalty-based HEVC. We are only waiting for hardware and GPU-accelerated encoders to show up which is certainly going to happen if one looks at the list of current AOM members. Markets such as Security & Surveillance have not adopted HEVC, nor has it taken serious steps to introduce new compression standards. The emergence of Broadcom among the Alliance members may indicate the imminent appearance of cameras using AV1 for video compression, which will inevitably lead to strengthen AV1 market penetration. Businesses in video surveillance systems and digital signage have never been particularly eager to maintain the broadcaster’s standards. Now that a new competing offering is available, one can only extrapolate growth. It is unclear what will happen in the smartphone market. Samsung is not a member of the Alliance, Qualcomm is keeping silent. It is likely that AVC will stay as the standard of video compression for mobile phones. HEVC and AV1 will be separated by legacy applications. "Legacy" companies such as TV Broadcasters will continue to use paid HEVC, while new, growing markets of OTT, Security&Surveillance, today’s millennial entertainment technologies such as Video Gaming/Streaming will prefer free AV1. Looking at the list of AOM members (Fig1-3) compared to MPEG LA HEVC Licensors it is a safe bet of where the market will trend towards. It is likely that future broadcasting standard (Maybe h.266? ), may be replaced by AV2 or AV3, but only time and market dynamics will tell. Dolby Laboratories Licensing Corporation - Affiliate of Dolby Laboratories, Inc.
Dolby International AB - Affiliate of Dolby Laboratories, Inc.
HFI Innovation Inc. - Affiliate of MediaTek, Inc.
You may find AOM AV1 video examples here. Use special edition of Elecard MPEG Player to decode AV1 videos. 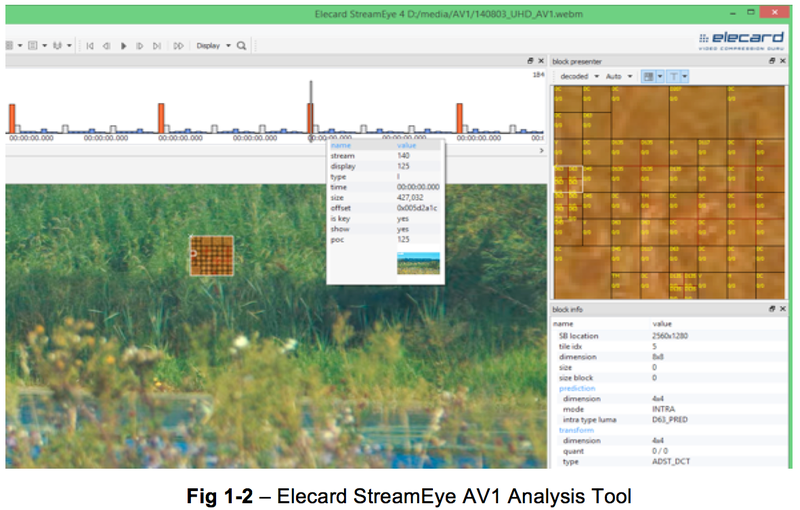 Use a special version of Elecard StreamEye to analyze AV1 streams. Have a look at Misha Codec Benchmark tool to see how AV1 compares to HEVC based on objective metrics.